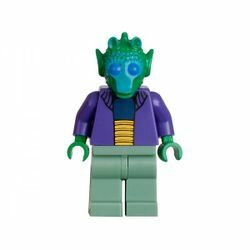 Onaconda Farr is a Star Wars minifigure first released in 2009, based on the Senator from the Star Wars universe. Onaconda Farr has a plain sand green leg piece, and a purple torso. The torso has matching purple arms, and dark green hands, reflecting Farr's skin tone. It also has printing on the front of the piece- black is used for outlining and detailing, and dark blue and orange printing is used in the centre of the piece, showing the clothing Farr wore underneath his purple jacket. Farr has a dark green Rodian head, and like all other Rodian heads, it is made from hard plastic like most LEGO bricks. Blue printing is used on Farr's eyes and over parts of the face. In LEGO Star Wars III: The Clone Wars, Onaconda Farr appears as a playable character. In the game, his character model is based on his physical minifigure, but comes armed with a black blaster. He also has the ability to jump, and perform a midair roll if the jump button is pressed twice. Onaconda Farr was the Senator of Rodia during the time of the Clone Wars. He briefly joined the Separatist forces when they promised his people food, but later went back to the Republic after he saw the true Separatist ways. He knew Padmé Amidala's father very well, and they were both good friends in the Senate. Being a close family friend, Farr was often referred to as "Uncle Ono" by Padmé. During the Clone Wars, Farr was assassinated by his aide, Lolo Purs, who wanted to punish the Senator for dragging Rodia into the war. Onaconda Farr in LEGO Star Wars III: The Clone Wars.